It has been almost 3 years since my first day coming to this small new township called Yanbu Al-Sinaiyah (Yanbu Industrial City) or popularly known as Yanbu RC (Royal Commission). Since then, it has seen a steady growth of Malaysian population which is now estimated to be around 300+ . More than a third are working in petrochemical industry but there are also high numbers serving the education industry teaching in two major colleges, YIC (Yanbu Industrial College) and YUC (Yanbu University College). ﻿﻿A number of industrial projects as well as tourism developments may well see a sharp increase of population in Yanbu. The Royal Commission for Jubail and Yanbu is currently implementing new projects worth SR1.4 billion in Yanbu, including a seafront project, aside from college buildings for girls, and infrastructure projects such as main and subsidiary roads. Pulang bercuti ke Malaya baru-baru ni agak spesel sikit pasal dapat bertemu dengan kekawan yang sungguh lama terpisah. Yelah, tahun 1980 dulu mana lah ada e-mail, YM ataupun FB. Maka selepas berpisah sekolah pada 1980, maka ramailah antara kita ni yang terpisah terus. Maka, mukabuku akhirnya berjaya jugak menemukan teman taulan yang sekian lama tidak ketemu. ﻿Semua gambar reunion ini credit to Nurhafizah @ Pijah yang diciluk dari FBnya. 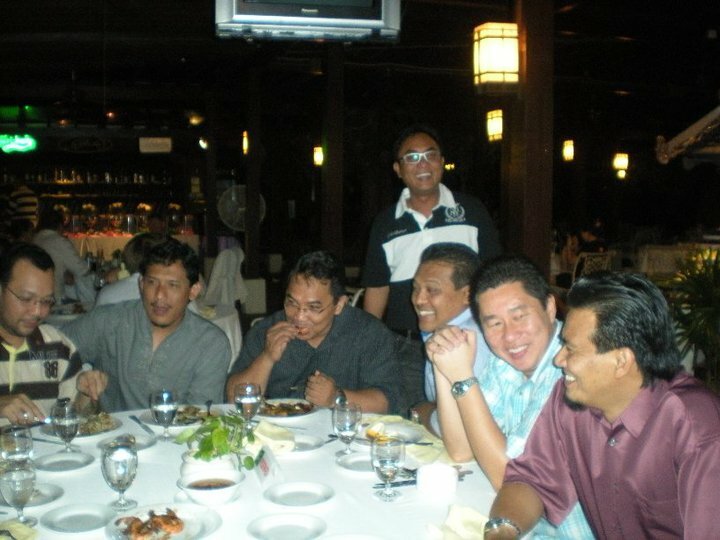 Seminggu kemudian (pada 7hb Ogos 2010) dapat pula bertemu dengan kekawan masa di sekolah menengah. Pertemuan dirancangkan di PNB Ilham Resort PD yang telah diusahakan oleh Yusri dan Anuar. Malangnya mereka berdua bersama keluarga masing2 terpaksa pulang pd petang itu juga kerana kemalangan maut yang telah menimpa adik ipar mereka. Berdiri dari kanan - Man Kudo, isteri Mawi, Sharina @ SBO, Radziah , Zulina (isteri zaidut) & isteri Wak Jor. 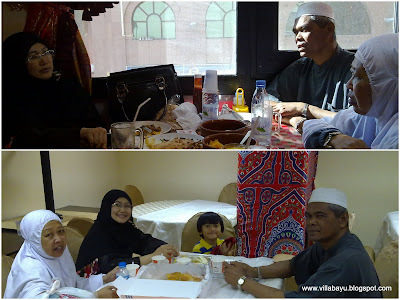 Hah.... yang kat bawah ni pulak bersama Hj Sadimin serta isteri nya semasa menghadiri majlis perkahwinan Ustaz Qamarul di Kota Singa (Singapura aka Singapore). 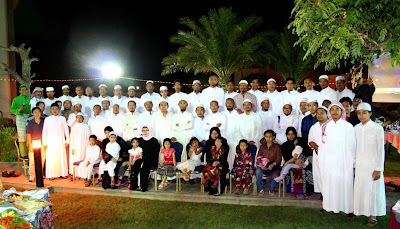 Yang ini pula bersama sahabat serumah dan sepejabat di PCOC dulu; Azilan & Zarina dengan family masing-masing semasa berbuka puasa di Singgah Selalu, Danga Bay di Johor Bahru. Azilan masih di PCOC, Zarina di Singapura dan aku di Arab Saudi tapi jarak tidak pernah 'memisahkan' kami. 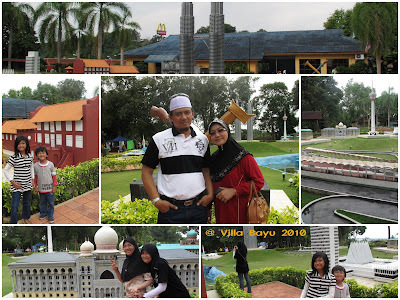 Here ... is my story of the recent vacation back to my lovely home country, Malaysia. A one month off was just too short for a summer break... hehehehehe... Masa begitu mencumburui ku. 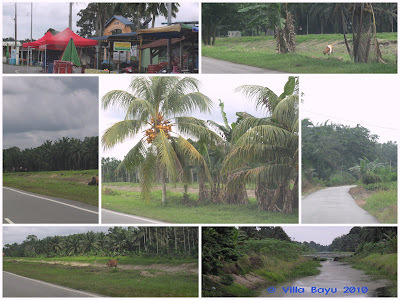 Every year, the best part is to 'balik kampung' (back to hometown or village). Nothing can't beat the excitement of 'balik kampung'. 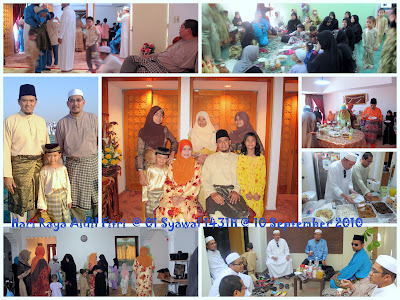 Terms of balik kampung can be referred to going back to ones' parents house. It doesn't matter if it is in town or village. 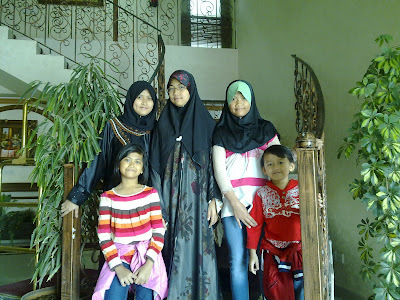 We just call it balik kampung. The scenic view of the road leading to my wife's kampung. The greens, cow and the small river or better known here as parit reflect the easy life of the kampung's folks. 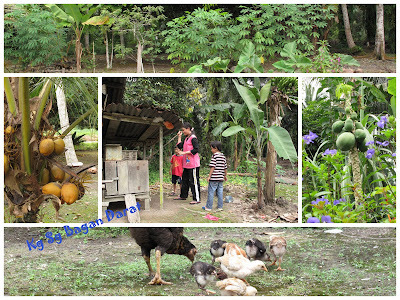 The fruits, the chicken and the kids at the back yard of their grandpa's house. The kids really enjoyed playing with the rooster. Somehow it reminded my chilhood days. Of course the holiday will not complete if you don't bring your kids somewhere called resorts, theme parks or places of interest where people love to go. We were no exception. This is Tanjung Puteri Golf Resort. A place we used to spending our weekends and evening during my days in PG. 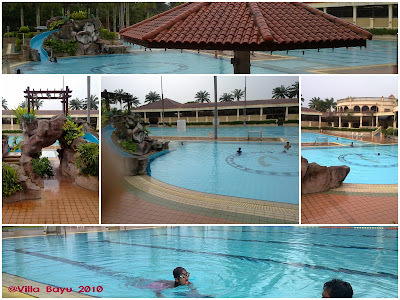 Nabilah was seen doing her swimming session with Wahid. A lot of people said that Singapore has one of the best zoo in this region. I guess they are right. Singapore Zoo is highly recommended for a visit. 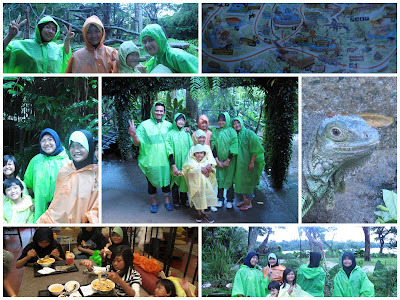 We took few days to spend in Singapore and of course the zoo was in our list. 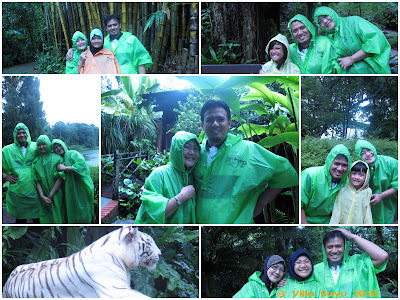 Unfortunately we didn't manage to visit the Night Safari which is only next to the zoo. 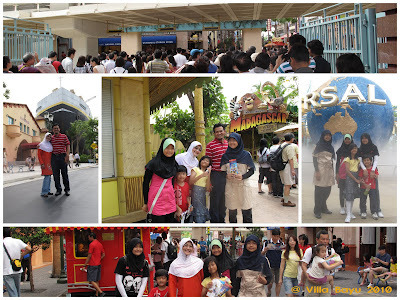 The newly opened Universal Studio located in Sentosa Island was our another destination. There are numbers of attractions suitable for just anybody. As for me, I loved watching that spectacular live water show at the WaterWorld. It was awesome! Some other attractions like Shrek 4-D Adventure, Revenge of the Mummy, Battlestar Galactica did bring a lot of fun and thrills as well. Back in Malaysia, unlike previous year where we spent days in Tioman, we decided not to go to any island. 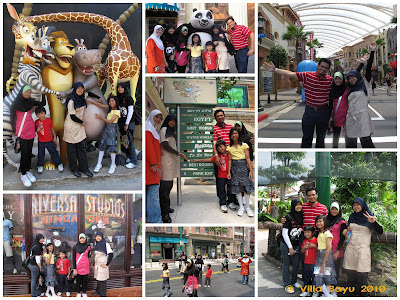 Instead we only visited Sunway Lagoon, Putrajaya and Melaka. That's already took us a week. 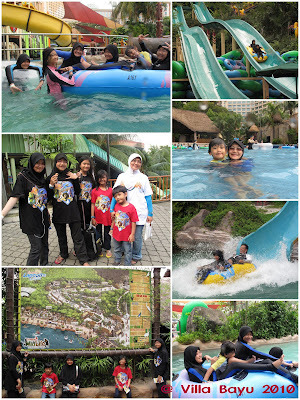 Sunway Lagoon & Resort, one of many popular water theme park in Malaysia. Guess what? 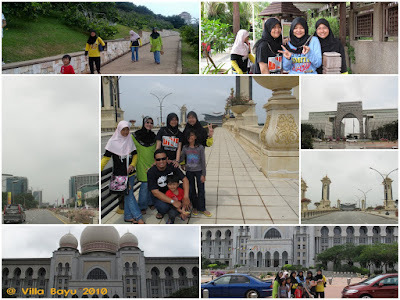 I realized that one needs at least two full day to explore Putrajaya. Besides its many unique and beautiful buildings, there are so many tamans that worth a visit. Among them are Taman Warisan Pertanian and Taman Botani Putrajaya. On the way back to JB, we made a quick stop at Air Keroh. No new attraction and it seems to look the same 10, 15 years ago. Alhamdullillah, praise to Allah, that this year we were able to celebrate and had our 1st week of Ramadhan with our beloved parents before going back to Saudi. 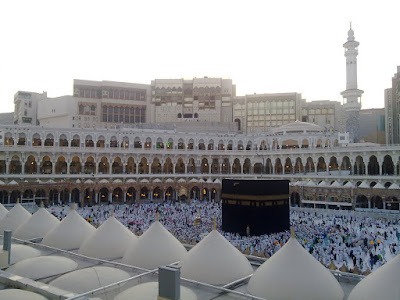 Makkah Al-Mukarammah - the city visited the most on earth since its freedom from the 'arab jahiliyah' about 1400 years ago. It is the city where muslim will always yearn to come again and again. 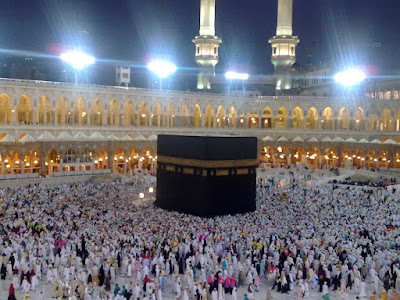 Its peak time during the Haj will see somewhere around 3 millions people year in year out gather in this city. There are quite a number of other names that refer to this city besides Makkah such as Bakkah, Ummul Qura', Al-Balad and Haram Amin. It's blessing that we live so near to this city that enable us to make frequent visits to this Islam holiest place. Many thanks and praise to ALLAH S.W.T..... Alhamdullillah. The start of year 2010 has been great. We spent the first two weekends in a row in this city. Those who have been here would know that feeling of serenity, humbleness and the closeness to our Creator. There is no god except ALLAH and Muhammad is His Messenger. 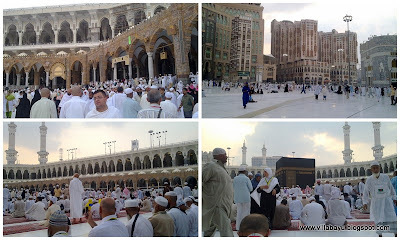 Here are some latest shots of Masjidil Haram, Ka'bah and some of the historical places around Makkah Al-Mukarramah. 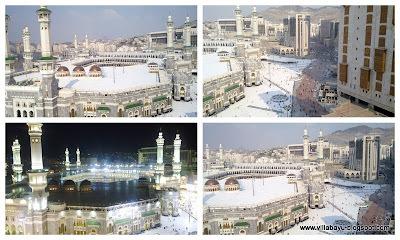 The above photos of Masjidil Haram's entrance of King Khalid as seen from the hotel. 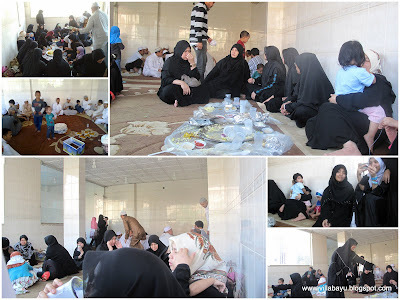 Quite a number of families from Yanbu as well from other cities like Jubail and Riyadh were also visiting the Masjidil Haram, taking advantage of the least crowded period in the city. There is about 4 weeks or so where no umrah visa is being issued by the Saudi Government after the last batch of pilgrimage left the country. Normally the umrah visa will be issued starting from the month of Safar. In the picture above, Khairuddin from Jubail and Ahadin from Yanbu. Lepak-lepak at the dataran Ka'bah. 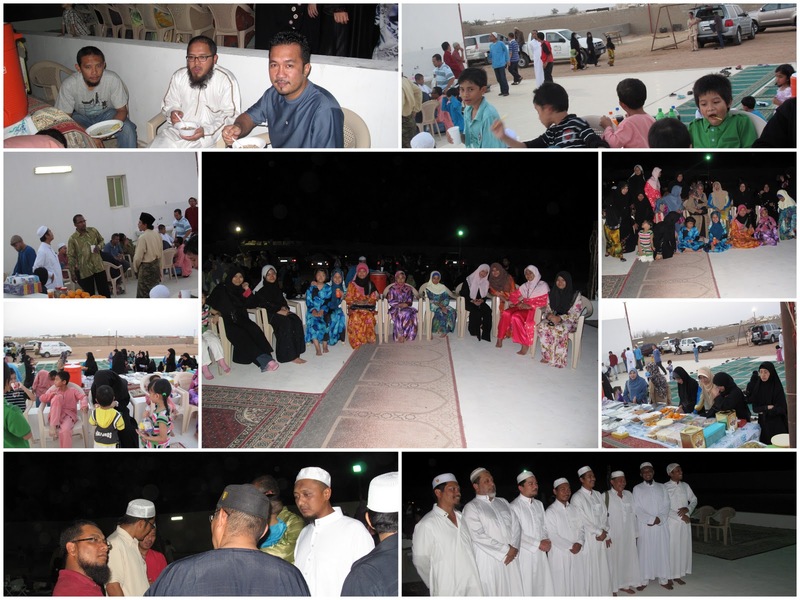 The second weekend of the year, together with some friends, we organized a 'Ziarah Makkah'. 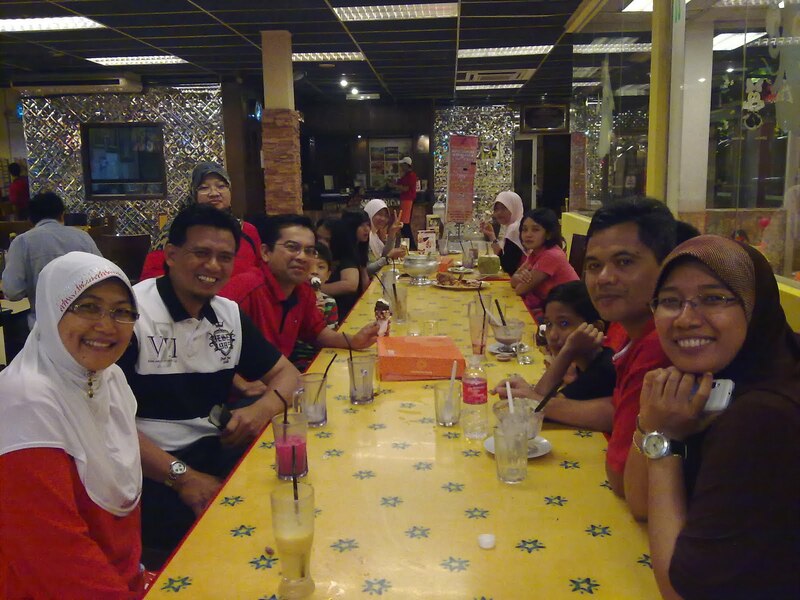 The ziarah was managed and led by ProTeam UQ. Thanks to all the Ustazs from Umm Qura' University. The first stop in the ziarah itinerary was Jabal Tsur. 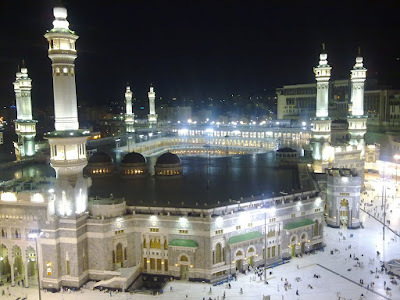 It is located about 4km to the south of Masjidil Haram. Its height is 748m from sea level and will require about 1.5 hours to reach its top. The story of the prophet and his best companion, Saidina Abu Bakar hiding in its cave before the hijrah to Madinah was so inspirational. 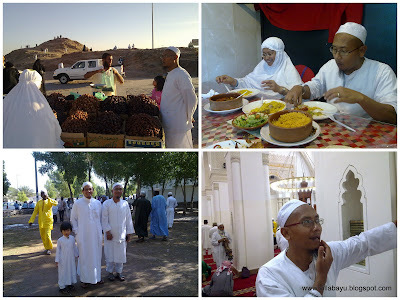 Ustaz Khairul as seen in the picture was telling the story at the foot of the Jabal Tsur. The next destination was the 'Manasik Haji' places started from Arafah and Jabal Rahmah. Being in Arafah is the Haj itself. During the haj, all pilgrimages will convert and gather at Arafah on what we call Hari Wukuf, which falls on the 9th of Zulhijjah every year. It was believed that Jabal Rahmah was where Adam and Eve met for the 1st time in this world after they were sent out of heaven. In Arafah, there is a masjid called Namirah. 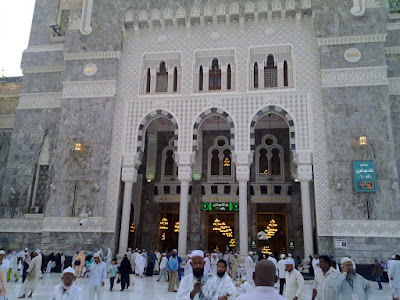 It was where Prophet Muhammad s.a.w gave his final khutbah. One thing special about this masjid which was built during the rulwer of Abasiyah is that its front is out of Arafah whereby its back is in Arafah. After Arafah, we passed by Muzdalifah and Mina (where the 3 jamrah is located). Mina is located about 7km from Masjidil Haram. At those Jamrahs where Abraham a.s threw stones to syaitan laknatullah. 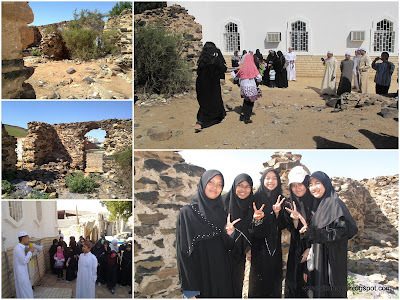 It was also a place where Ansar people gave their 'bai'at' to the Prophet Muhammad s.a.w which is known as Bai'at al-aqabah al-ula and Tsaniyah. Next, we were brought to Hudaibiyah. It is situated on the old road connecting old Jeddah to Makkah. It's currently known as al-Syumaisi. This is the place where the famous 'Hudaibiyah Treaty' took place between the Muslim from Madinah led by Prophet Muhammad saw and the Quraisy from Makkah. There is new masjid built next to the ruins of the old masjid. Before heading back to the city, we dropped by the camel farm nearby Masjid Hudaibiyah. Most of us at least bought a bottle of fresh milk. The kids were seen to enjoy the most with those camels. According to some stories, camel does have its special place in the history of our Prophet Muhammad. Camel is believed to be the most shy animal on earth. It is also an animal with the most charming smile, I guess. 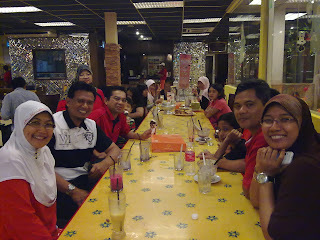 We had our lunch of arabian cuisine at the famous mata'am (restaurant) which I forgot the name and its location. There we were served with 'laham' and 'dajaj mandi', literally means lamb and chicken with rice cooked as per local traditional way. 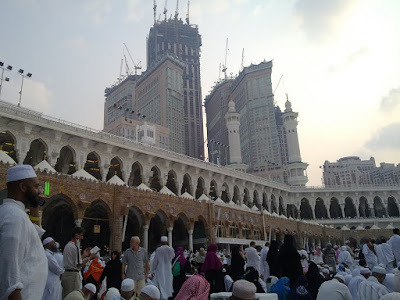 Just right before Asar praying time, we were already back to Masjidil Haram. Finally, at night our ziarah to Makkah was ended with a 'Forum Perdana' or religious talk given by Dr. Taib and Ustaz Hafiz on a topic of hijrah. And of course, not to mention the sumptuous meal specially cooked and prepared for the night. Many thanks to UQ Proteam and those involved in making this ziarah a success. Kesibukan tugas serta aktiviti harian di tambah dengan sifat kemalasan tu buat aku seolah-olah lupa tentang kewujudan blog ini. Sikit punyer lama blog ni tak diisi dengan cerita terkini. 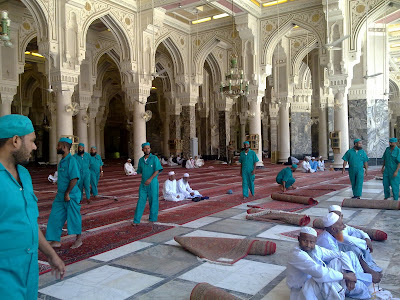 Penghujung tahun 2009, kami sibuk mengunjungi Kota Madinah kerana ingin bertemu rakan taulan serta sedara mara yang sudah selesai mengerjakan haji. Perasaan dapat berjumpa dengan kawan-kawan maupun sedara mara serta kenalaan dari Malaysia seperti macam ada keistimewaannya tersendiri. 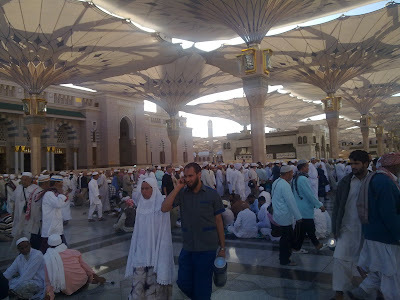 Maka kalau ada kekawan yang baca entry ini dan berpeluang untuk datang ke sini samada mengerjakan umrah maupun haji, calling-calling lah kami yer..
Bersama dengan Haji Damsuki serta Haji Safawi Tuan Haji Abdul Aziz beserta dengan isteri Puan Hajah Karina Sepupu Mama Bungas beserta dengan isterinya (abg Usop dan Kak Zizah) Sekitar Masjid Nabawi selepas solat Asar. It was the wukuf day that we started our journey at 9 am from Yanbu heading toward but bypassing Madinah before taking Madinah-Riyadh Expressway. There's nothing much to see along the expressway. Sepanjang perjalanan cuma nampak padang pasir je dengan satu dua tempat nampaklah kebun-kebun kurma serta kawasan penanaman rumput. We safely reached Riyadh around 7 pm and met Haji Fauzi (a friend of a friend) who helped us in making a reservation at one of many service apartments in Riyadh. Bergambar kenangan dengan sebahagian rakyat Malaysia di perjumpaan Aidil Adha. So, we found ourselves to be praying solat Aidil Adha in the nearby mosque. Around 10 am, we were invited to join fellow Malaysians residing in Riyadh for the Eid gathering at Haji Zainal's house. 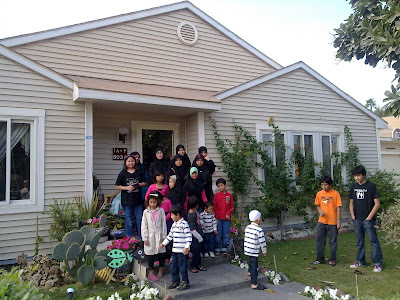 Syukran jazakallah for their hospitality. After two nights in Riyadh, we decided to cut short the stay and moved to Al-Khobar, about 400 km to the most eastern part of the kingdom. Dammam/Al-Khobar and Dhahran are the three adjoining cities known as triplet city making up the greater Damman area. It was raining heavily all the way from Riyadh to Khobar, felt like driving in Malaysia. We reached Al-Khobar four hours later. It was quite tiring and frustrating when you were stucked in heavy traffic jam while looking your way to find an apartment or hotel to stay at. Finally we managed to find a decent service apartment near to a popular and well known Al-Rashid Mall. 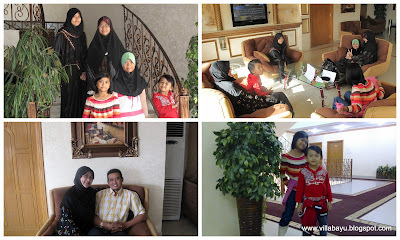 In the morning of the 1st day in Al-Khobar we went to Dhahran (about 10 minutes drive) visiting Ghazali's friend, Haji Zulkiflee at Aramco compound. A totally new environment as if you were not in Saudi Arabia but in America. There you can see women were jogging and without their abaya. Kat dalam tu jugak ada panggung wayang serta padang golf. Perempuan pun boleh memandu asalkan ada lesen memandu dari negara asal. Back from Dhahran, we went sighseeing the city of Al-Khobar. We even went up to the Bahrain checkpoint at the middle of the Khobar-Bahrain causeway. Kalau lah senang nak keluar masuk saudi, memang dah sampai Bahrain tu. It is well known that people as far as from Riyadh like to come to Al-Khobar as the city is very lively and 'happening'. 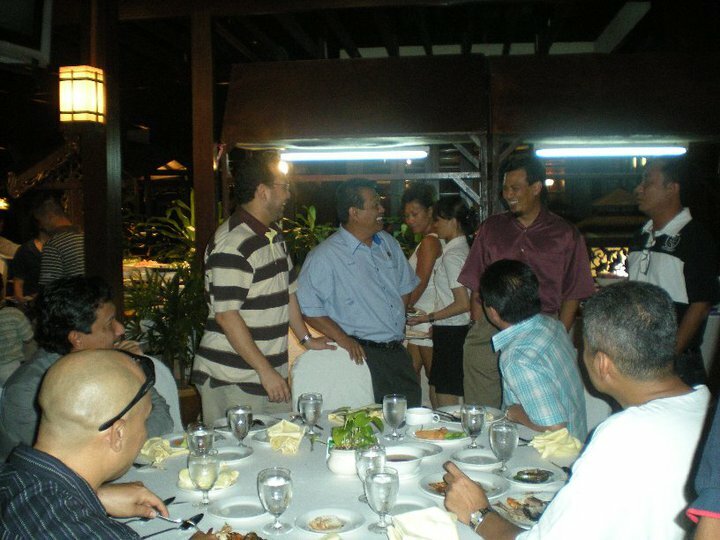 Bersama Mokhtar dan Haji Shafiee di Jubail. The following day we went further up to Jubail, the city of petrochemicals, visiting my friends. We also took the time to tour Jubail Industrial City before heading back to Riyadh again. We spent another night in Riyadh before continuing our journey back home to Yanbu. Tuan Haji Zainudin Ismail aka Che Din. 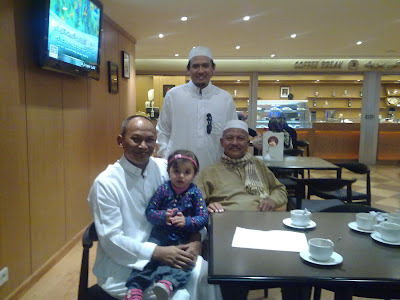 Kawan sekuliah... datang mengerjakan haji dari Doha, Qatar. We reached Madinah after 8 hour drive from Riyadh. We purposely stopped by at Masjid Nabawi just to visit my old friend who performed the haj. Alhamdullillah we reached home safely after completing 3500 km journey. Need info related to Yanbu, Saudi Arabia or info related to Malaysians living in Yanbu? 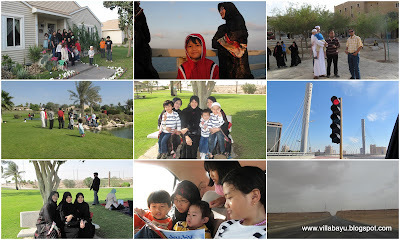 Looking for bloggers who are living and staying and working here in Yanbu? 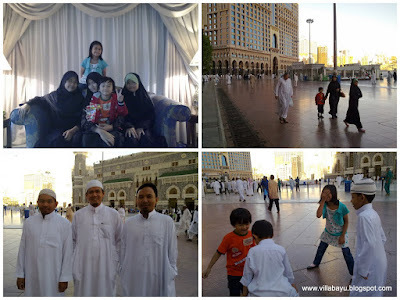 Alhamdullillah, last weekend our family managed to visit the Holy City of Makkah Al-Mukkarramah. 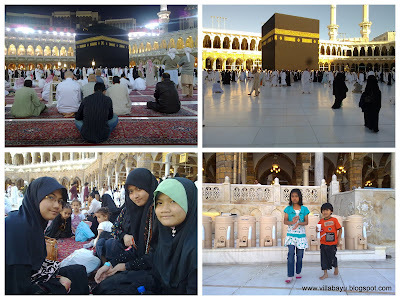 It was just a visit to spend the weekend there as we didn't perform the Umrah. However, the best thing happened as there was a heavy rain together with the thunderstorm and lightnings. 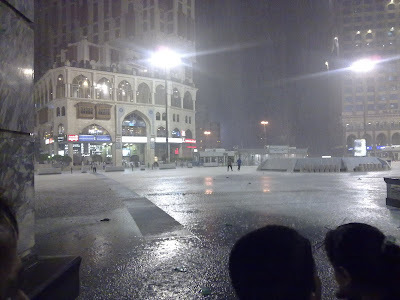 It was the first heavy rain we have ever experienced in Saudi Arabia after being here for more than 1 and half year. 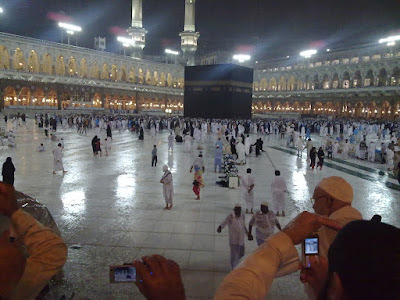 So 'jakun' to see the rain here, especially right at the Kaabah. 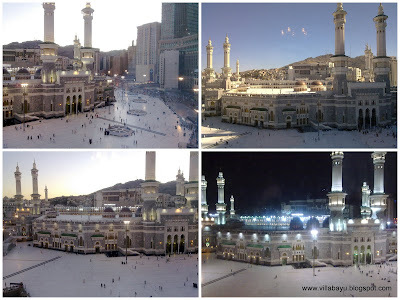 Here are some of the latest photos of Masjidil Haram. Views of the MasjidilHaram from the hotel. Kelihatan para jemaah haji yang mula membanjiri kota suci ini menyambut panggilan Ilahi. Zam Zam Tower menjulang tinggi ke langit. Boleh dilihat jauh dari luar Kota Makkah. Lautan manusia melakukan tawaf selepas solat subuh Kelihatan istana raja yang tersergam 'megah'. Pekerja masjid sedang membentangkan permaidani sebelum waktu solat Jumaat di tingkat satu. Hujan lebat beserta kilat dan guruh membersihkan debu-debu di Kota Makkah selama satu jam selepas Maghrib. Dataran luar MasjidilHaram di genangi air hujan. Beli Buku Online! Mudah & Jimat! Dapatkan buku-buku popular Malaysia di Kedai-Buku.com.